Part of Nashville's Rich Heritage. The history of the our downtown neighborhood and the Hotel Indigo site is rich with printing, music and banking lore and today, the legend continues in Headlines. The name Headlines reflects the unique history of our location adjacent to World Famous Printers Alley, the little backstreet that once served as the printing capital of the world. 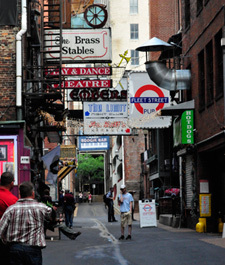 Printers Alley made headlines in the 1890s as the location for major printers, newspapers and publishers and later with trend-setting music clubs showcasing performers who became Music City icons. Headlines is conveniently located at the Hotel Indigo, one of Nashville’s premier boutique hotels with a rich history of its own as the former site of the American Trust and Nashville Trust buildings. Many architectural features remain in the hotel from those early bank days. 1905 Union Bank and Trust purchases the property at the corner of Union and College Street (now 3rd Ave. N). Construction begins on the new bank building. 1911 American National Bank absorbs Union Bank and Trust. 1923 Work begins on adding 11 floors to ensure the building is taller than the Nashville Trust building next door. General contractor is Foster & Creighton. The building is named the American Trust Building and is the tallest building in Nashville. 1949 to 2006 The building changes hands numerous times. 2010 Hotel Indigo opens in both the American Trust Building and the National Trust Building. 2013 Headlines opens at Hotel Indigo. 1925 The President of Nashville Trust Company standing on Union, points to the southeast corner and tells a contractor he wants a new bank building there. Construction begins. 1926 Nashville Trust decides to add 14 stories to the building after American Trust adds 11 stories to its building next door. 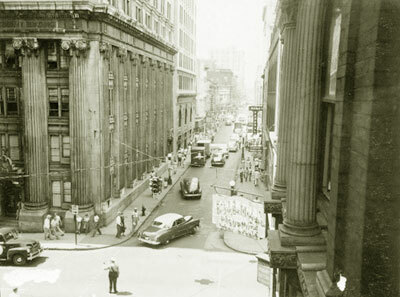 Central National Bank moves into the building. Directors include William and Charles Nelson, grandfather and father of future Commerce Union CEO Ed Nelson. 1980 to 1995 Nashville City Bank occupies the building followed by RegionsBank. The city has a rich heritage including Printer's Alley, the Ryman Auditorium, Broadway, 2nd Avenue and Riverfront Park.. Headlines is close to the dynamic heart of the city, in an area steeped in cultural and architectural history.